Fuse Integration Services (FIS) provides a set of tools and containerized xPaaS images for developing, deploying, and managing microservices on OpenShift. For FIS projects, JBoss Fuse Tooling requires installation of the Red Hat Container Development Kit (CDK) v3.x. See Getting Started Guide: Container Development Kit for instructions. In addition to the prerequisites specified in this guide, you need to establish a Red Hat account if you do not have one. 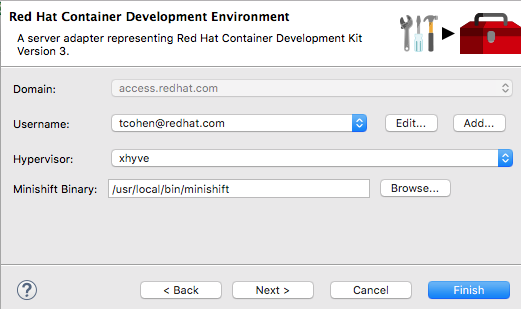 Your Red Hat user name and password are required to start the virtual OpenShift instance provided in the Red Hat Container Development Kit. You can easily get an account by registering on the Red Hat Customer Portal. Click in the upper right corner of the white banner, and then click on the Login to Your Red Hat Account page. 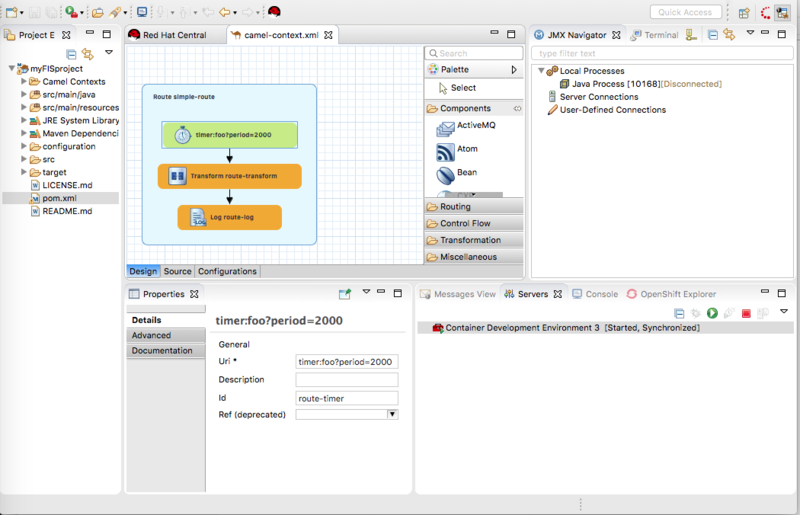 JBoss Fuse Tooling enables you to develop and deploy FIS 2.0 projects using the s2i binary workflow. In this workflow, the tooling builds your project locally, assembles it into an image stream, then pushes the image stream to OpenShift, where it is used to build the Docker container. Once the Docker container is built, OpenShift deploys it in a pod. JBoss Fuse Tooling works only with the S2I binary workflow and only with projects based on the Spring Boot framework. Although JBoss Fuse Tooling can deploy FIS projects created using the tooling to remote OpenShift servers, this chapter describes creating and deploying FIS projects to a virtual OpenShift instance, installed locally using the Red Hat Container Development Kit (CDK) v3.x. 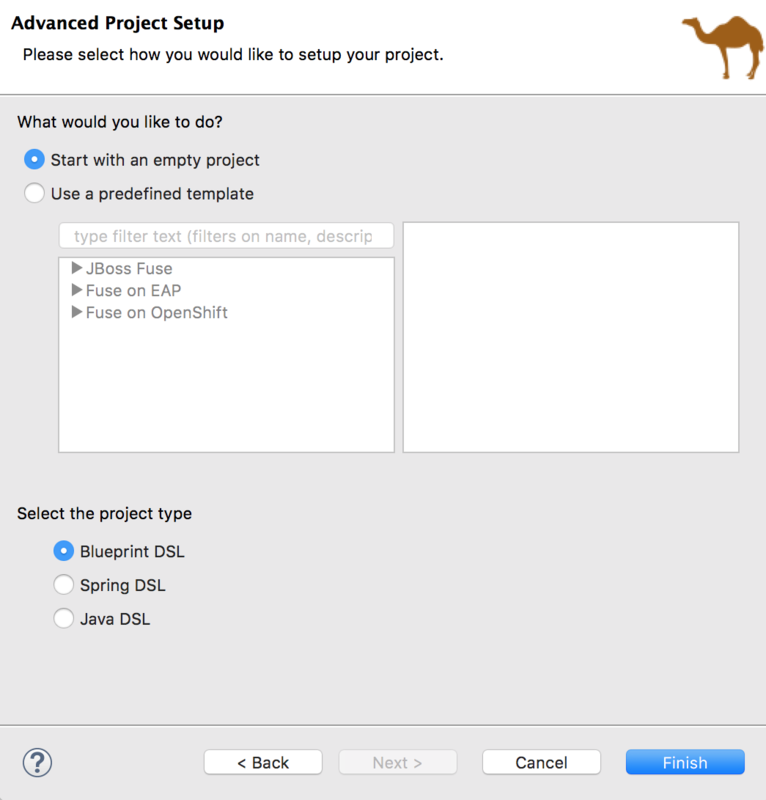 You can also run a Fuse FIS project as a local Camel context, see Section 9.1, “Running routes as a local Camel context”, and then connect to it in the JMX Navigator view, where you can monitor and test the routing context. 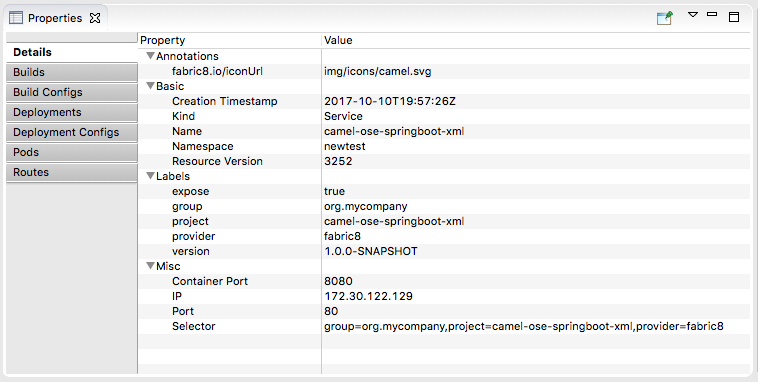 You can also run the Camel debugger on a Fuse FIS project (olink:RiderUG/RiderCamelDebugger) to expose and fix any logic errors in the routing context. If necessary, switch to the Fuse Integration perspective. If, in this or any other section in this chapter, a view described in a procedure is not open, you can open it by clicking Window → Show View → Other → view_name . In the Servers view, click the link No servers are available. Click this link to create a new server…​ to open the Define a New Server wizard. This link appears only when the Servers view contains no server entry. Otherwise, right-click in the view to open the context menu, and then select New → Server to open the Define a New Server wizard. 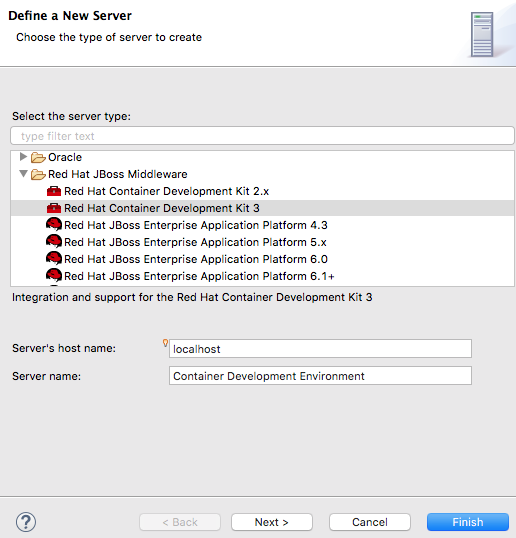 Select Red Hat JBoss Middleware → Red Hat Container Development Kit 3. Click Next to open the Red Hat Container Development Environment page. Next to Folder, click Browse, navigate to the location where you installed the Red Hat Container Development Kit 3.x and click Open. Next to Username, click Add to open the Add a Credential page. Username — Enter the name you use to log into your Red Hat account. Always prompt for password — Leave as is (disabled). Password — Enter the password you use to log into your Red Hat account. Click Finish. Container Development Environment 3 [Stopped, Synchronized] appears in the Servers view. Container Development Environment 3 is the default server name when you add a CDK 3.x server. Starting the Container Development Environment (CDE) also starts the virtual OpenShift server. Stopping the CDE also stops the virtual OpenShift server. In the Servers view, select Container Development Environment 3 [stopped, Synchronized], and then click on the Servers menu bar. On initial startup, the CDE asks whether you accept the untrusted SSL certificate. Click Yes. Switch to the OpenShift Explorer view. https://192.168.99.100:8443 is an example of a URL for the OpenShift developer web console. Your installation displays the URL for your instance. For more details, see the section called “Accessing the OpenShift Web Console”. When you deploy your Fuse FIS project to OpenShift, it is published to the OpenShift project you create here. In the OpenShift Explorer view, right-click the developer entry, to open the context menu. Select New → Project to open the New OpenShift Project wizard. In the Project Name field, enter the name for the project’s namespace on the virtual OpenShift server. Only lower case letters, numbers, and dashes are valid. In the Display Name field, enter the name to display on the virtual OpenShift web console’s Overview page. Leave the Description field as is. MyProject myproject is an initial example project included with OpenShift. When you deploy the project to OpenShift, the Properties view gathers and displays the same information about the project that the OpenShift web console does. 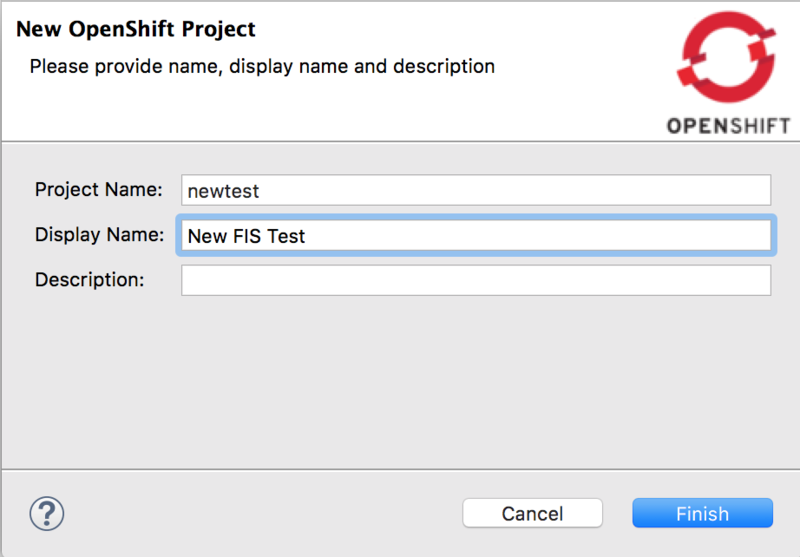 Before you create a new Fuse FIS project, you should enable staging repositories. 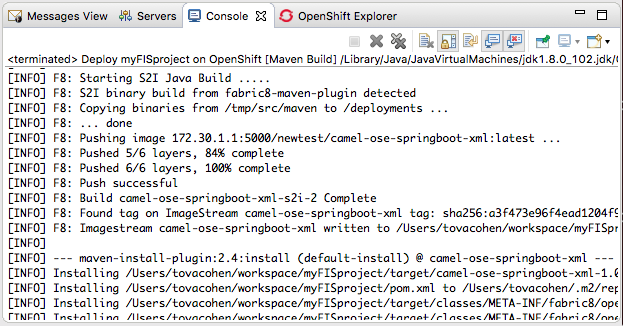 This is needed because some Maven artifacts are not in default Maven repositories. To enable staging repositories, select Window → Preferences → Fuse Tooling → Staging Repositories. 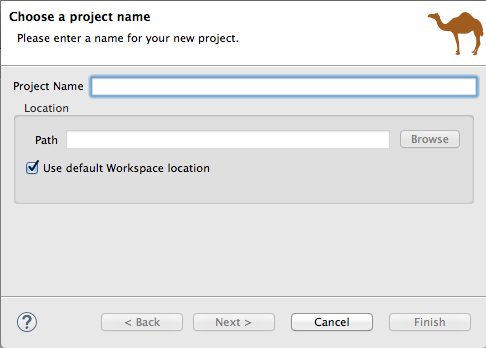 In the Project Name field, enter a name that is unique to the workspace you are using, for example, myFISproject. Accept the defaults for the other options. 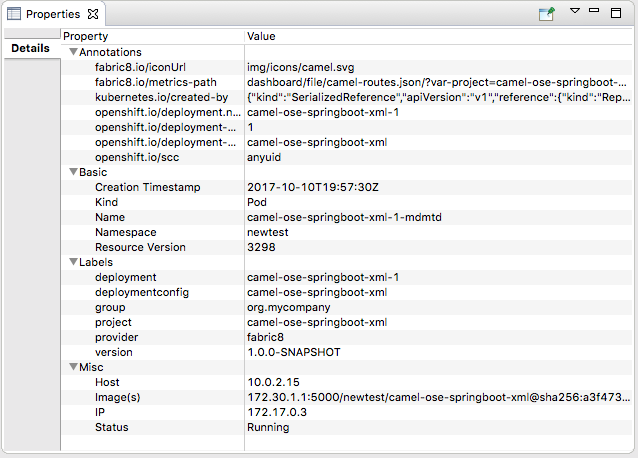 Leave the defaults for Target Runtime (No Runtime selected) and Camel Version (2.18.1.redhat-000015). 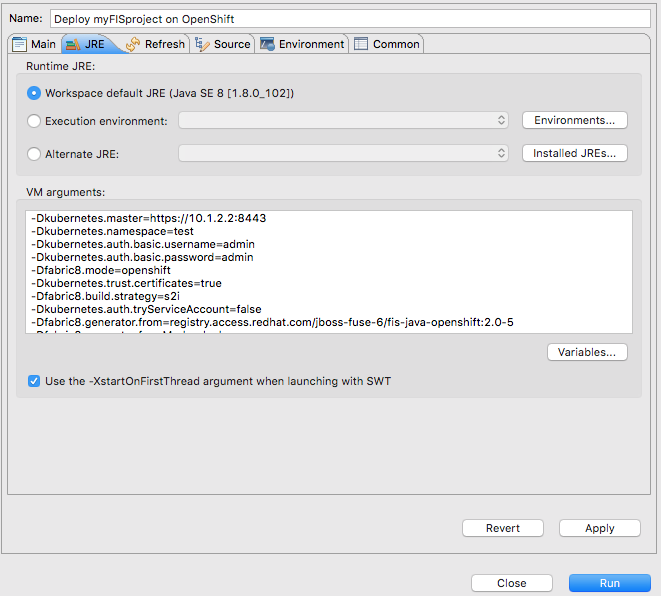 Select SpringBoot on OpenShift, and then click Finish. 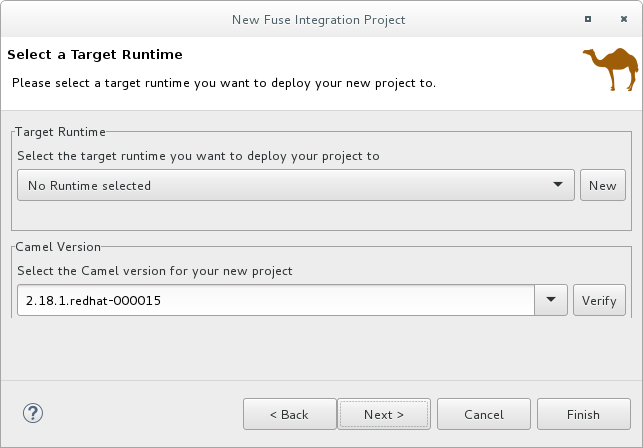 Because of the number of dependencies that are downloaded for a first-time Fuse FIS project, building it can take some time. If the Fuse Integration perspective is not already open, Developer Studio prompts you to indicate whether you want to open it now. Click Yes. View a route component’s JMX statistics — see Chapter 22, Viewing a component’s JMX statistics. Edit the running route — see Chapter 26, Managing routing endpoints. In the Project Explorer view, right-click the project’s root (in this example, myFISproject) to open the context menu. 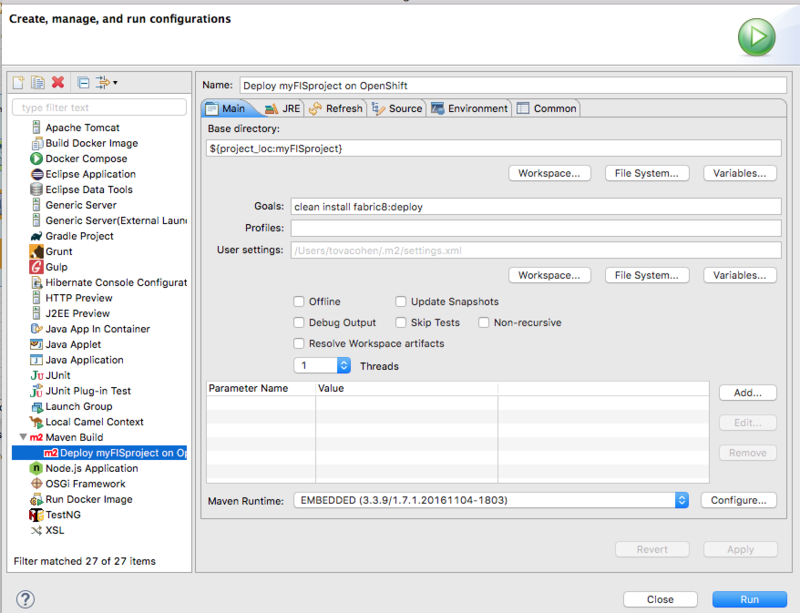 Select Run As → Run Configurations to open the Run Configurations wizard. Leave the default settings as they are on the Main tab. In the VM arguments pane, change the value of the -Dkubernetes.namespace=test argument to match the Project name you used for the OpenShift project when you created it (OpenShift project name in the section called “Creating a new OpenShift project”. When running multiple OpenShift instances or using a remote instance, you need to specify the URL of the OpenShift instance targeted for the deployment. The URL above is an example. When using the CDK, this argument is required. Leave it set to true. If you are using an OpenShift instance that has a valid SSL certificate, change the value of this argument to false. Click Apply and then click Run. Because of the number of dependencies to download, first-time deployment can take some time. The speed of your computer and your internet connection are contributing factors. Typically, it takes 25 to 35 minutes to complete a first-time deployment. In the Console view, you can track the progress of the deploy process. In the following output, the entry *Pushing image 172.30.1 …​.. * indicates that the project built successfully and the application images are being pushed to OpenShift, where they will be used to build the Docker container. In the Properties view, the Details page displays all of the project’s property values. Open the other tabs (Builds, Build Configs, Deployments,…​) to view other properties of the project. The Properties view provides the same information as the OpenShift Web Console. Scroll through the other tabs to view other properties of the deployment configuration. 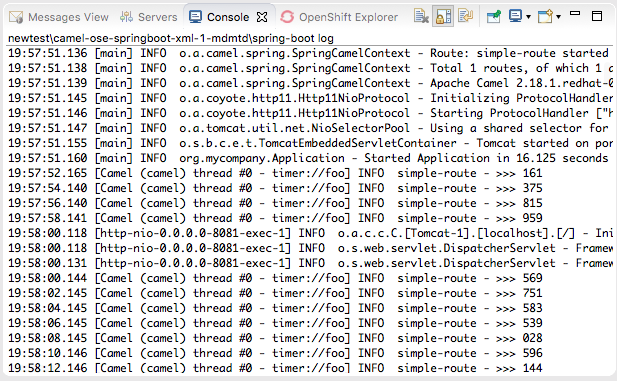 In the OpenShift Explorer view, right-click camel-ose-springboot-xml-1-mdmtd Pod Running, and then select Pod Logs…​. If prompted, enter the path to the installed oc executable. It is required to retrieve pod logs. Click in the Console view’s menu bar to terminate the session and clear console output. This information applies to Red Hat Container Development Kit installations only. To access the OpenShift Web Console, open a browser and enter the OpenShift server’s URL, which is specific to your instance and your machine. For example, enter https://192.168.99.100:8443, in the browser’s address field. 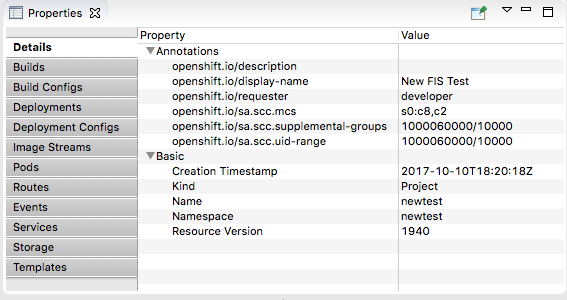 Developer users can view only their own projects and the supplied OpenShift sample project, which demonstrates OpenShift v3 features. Developer users can create, edit and delete any project that they own that is deployed on OpenShift. 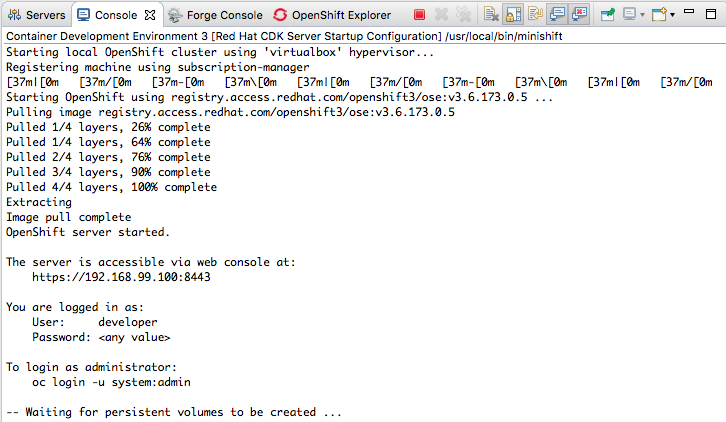 An administrator user can view and access all projects on OpenShift (CDK). Administrator users can create, edit and delete, any project deployed on OpenShift. For more information on using the OpenShift web console, see Getting Started Guide: Container Development Kit.